There are many important factors to consider when selecting a cooling tower. Tower flow rate, hot and cold water temperature, as well as wet bulb temperature all play a role in determining which cooling tower might be the right one to use. By selecting the right products and configuration, you can easily lower costs, improve performance, and prevent mistakes that often end up being very costly. 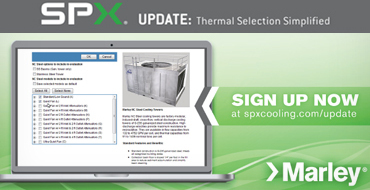 Marley provides a free online tool called UPDATE that can assist any business in the process of cooling tower selection. UPDATE allows you an easy way to key in the necessary specifications and see, at a glance, the cooling towers that might be right for you. All the different design conditions and their defaults are right there so that you can easily select the ones that apply to your business. Optimize cooling tower selection based on different criteria such as energy consumption, sound performance, life-time costs etc. Update allows you to compare different cooling towers by sorting selection results by various column headings. To see which cooling tower is right for you, simply plug in the design specifications into the UPDATE online tool. The relevant cooling towers will be displayed and you can sort them and compare them, print out data sheets, and finally make a selection that is right for your application. To see how UPDATE can assist your business in making the right choices for cooling tower selection please click to here.